An Indiana State University nursing professor will spend part of her spring semester basking in the warmth of Thailand, within miles of some of the world's most appealing vacation spots. But Betsy Frank won't be vacationing. Frank is packing her bags to leave Dec. 31 for a six-week trip to Suan Sunandha Rajabhat University in Bangkok. There, she'll be teaching student nurses how to work with English speaking patients and training nursing faculty the basics of teaching online course. "It's a great opportunity," she said. "I look forward to traveling every chance I get." Frank's travel opportunity is a byproduct of the educational tie ISU began formally cultivating with Thailand in 2000. ISU is part of a collaborative international exchange agreement with 12 universities in Thailand. Through the collaboration, faculty from the departments of music, business, education and nursing have traveled between the two countries in an effort to strengthen learning opportunities for students and faculty in both countries. For Frank, the visit to Thailand also provides an opportunity to continue the work she began there a year ago. After meeting the dean of Suan Sunandha Rajabhat University's nursing program in 2008, Frank was invited last year to teach professional issues and ethics to nursing students and teaching strategies to faculty. During that visit, Frank managed to orient herself quickly in a country in which she didn't speak the native language. She often sought assistance from English speaking students or other visitors to the country, and she taught her classes with the help of an interpreter. Having learned last year how to adapt to life in Bangkok, she said she's particularly anxious to return. "The people are so wonderfully open and welcoming," she said. "It's the land of happy smiles." Frank is also looking forward to connecting with Thai students, she said, who aside from their outward appearance and more formal behavior are essentially the same as American students. College "admission is very competitive, but once they're enrolled they behave much like Americans," she said. "Some of them miss class routinely, or come in late. They're typical students." Frank will arrive in Bangkok, Thailand during the time of year when average temperatures reach the 90s. But the heat is not enough to dissuade Frank from traveling. "It opens your eyes to the world in such a unique way and you can bring that back to the classroom," she said. "It gives you a real sense of the differences in cultures that helps you understand the world." "I wouldn't miss that for anything." Contact: Betsy Frank, professor of nursing, College of Nursing, Health, and Human Services, Indiana State University at 812-237-3481, or betsy.frank@indstate.edu. 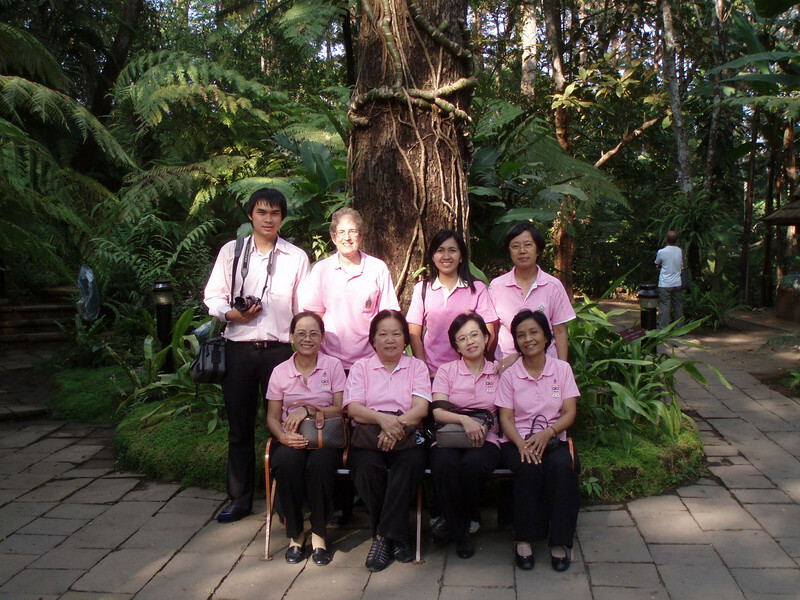 Cutline: Betsy Frank, standing second from left, tours the King's Winter Palace in Chiang Mai, Thailand along with faculty and staff of Suan Sunandha Rajabhat University. ISU Professor Betsy Frank will spend the months of January and February living in Bangkok and teaching Thai faculty about online learning.